Thanks to Dr. Rodney Shackelford, Tulane University School of Medicine, Louisiana (USA) for contributing this case and the discussion. To contribute a Case of the Week, follow the guidelines on our Case of the Week page. This 24.25 hour review and update in the areas of clinical immunology, microbiology, and infectious diseases is intended to improve knowledge about the pathogenesis and clinical manifestations of infectious diseases, immunological mechanisms of disease and disease prevention, appropriate approaches to the diagnosis of infections and immunologic disorders, and utilization of the clinical microbiology and immunology laboratory including selection and interpretation of results. Do you have subspecialty expertise and want to be a resource for Pathologists worldwide? PathologyOutlines.com, the leading online reference for pathologists with 13,000 daily visits, is seeking reviewers for many of its 6600 topics. We now have a Reviewer Resources chapter, with a new Reviewer FAQ page to answer your questions about being a reviewer and a Chapters in Review page that shows which chapters are in need of review. We have changed our review process and are currently looking only for reviewers for the chapters listed. 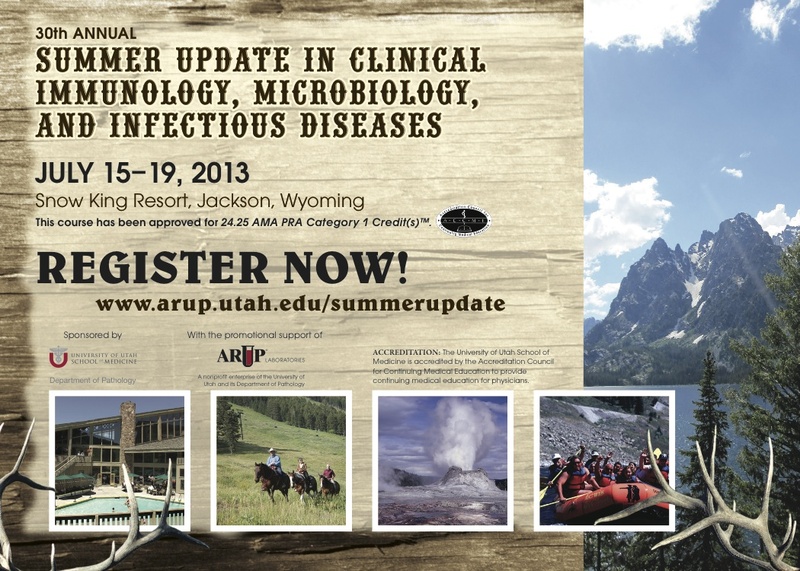 Senior residents / fellows may be able to review under the direction of an expert. Please contact us if interested. In 1986, a 13 year old girl in Pripyat, now an abandoned city in the Ukraine, was exposed to the Chernobyl nuclear plant explosion for 48 hours prior to being evacuated. She lived 3 km from the nuclear plant. Twenty two years later, at age 35 years, she developed recurring upper abdominal pain and underwent upper endoscopy with gastric biopsy. 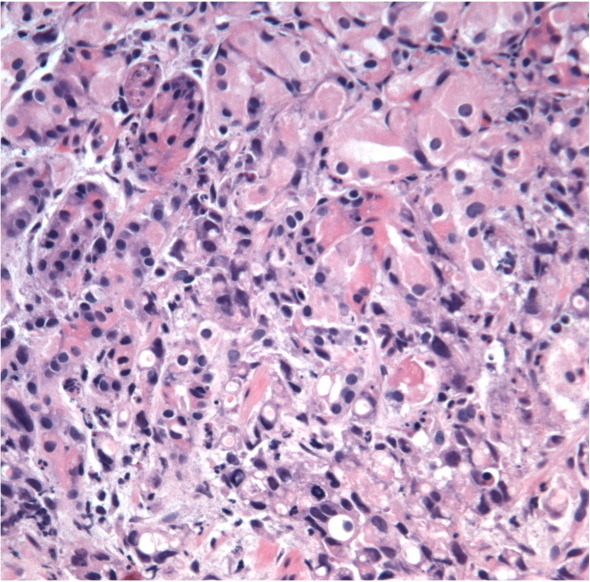 The biopsy shows a gastric adenocarcinoma characterized by gastric mucous cells that infiltrate the stroma as single cells, or small clusters of cells with numerous signet ring cells where intracellular mucin pushes the nucleus to the periphery. 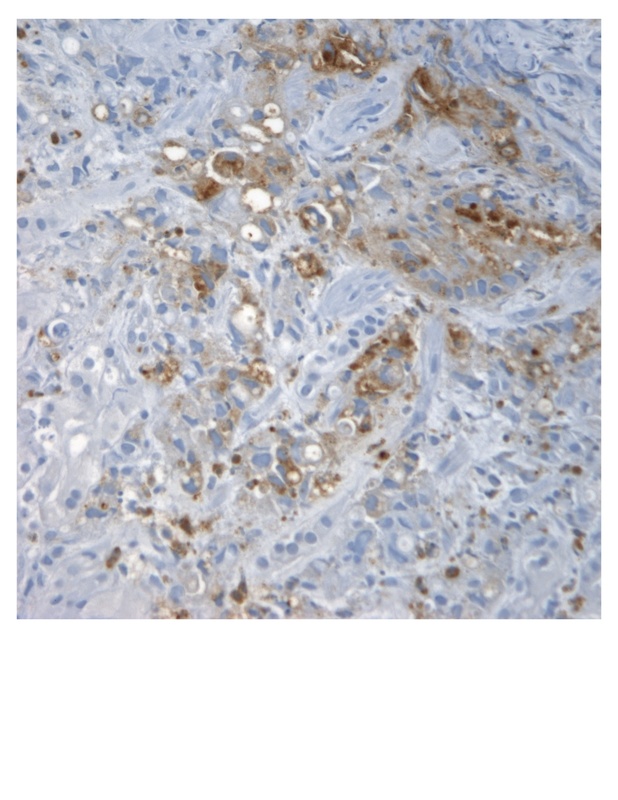 The tumor cells were immunoreactive for CAM5.2 and CEA (shown above). Often the central intracellular mucin can be highlighted with mucicarmine or Alcian blue-PAS stains (intracellular mucin gives a �target pattern�). 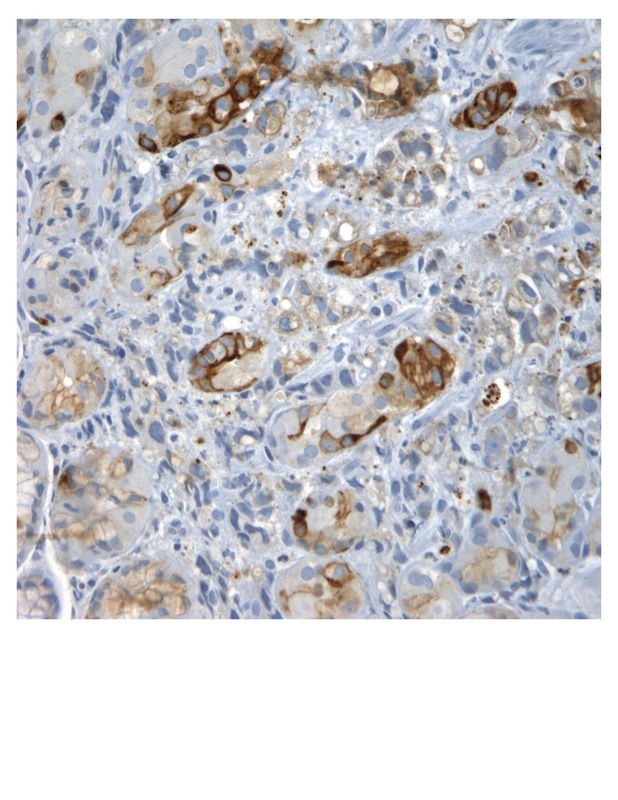 The tumor cells are also immunoreactive for EMA, villin and Ki-67 and negative for CD45 and TTF1. • Lymphoma with artifactual signet ring cells due to cytoplasmic shrinkage. CD45 is usually positive in lymphoma. • Metastases from breast or lung; clinical history, plus the use of appropriate immunostains such as TTF1 or GCDFP-15 is helpful. • Reactive epithelial atypia associated with radiation treatment or chemotherapy. The Chernobyl nuclear accident is known for having caused a large number of aggressive pediatric papillary thyroid carcinomas, especially in Belarus (1). There may be some Chernobyl-related gastric cancers that exhibit an unusually aggressive clinical course (2). The treatment usually involves surgical resection or chemotherapy. Presently the prognosis is poor.